NBC's Ann Curry, at the top of the 8:30am half hour of Today's July 14 show, teased viewers that "Americans, on average, took about 17 weeks to find a job. Well today the number has actually doubled. It's twice that. So the question is where should you be looking for work? We've got some answers this morning." However when viewers tuned in for those answers they also got a not so veiled anti-Republican diatribe from the National Urban League's Marc Morial as he chastised those who opposed Democratic measures. MATT LAUER: Marc, let me start with you. I mean 9.5 percent, that's where the unemployment rate stands right now. It's been stubborn, it's not going down nearly fast enough and apparently this job crisis is not an equal opportunity unemployer. It's striking minorities much harder, isn't it? MARC MORIAL: African-Americans, the, the rate is more like 16 percent, for Latinos it's 12 percent. There is no doubt that this recession has been tough for everyone but it's been especially tough for communities of color. People are hurting. They're hurting in a very significant fashion and many, many people who've worked their entire lives find themselves without work. The new unemployed, it's a lavender recession. It's white collar, blue collar, pink collar, it's across the board, Matt, but especially tough for people of color. LAUER: When you talk about minority communities and you talk to the people in those communities, are you telling them you think the jobs are coming back or are they gone for good? MORIAL: We're saying that steps have to be taken. And I think our message has been consistent throughout the year that it's not gonna happen serendipitously. There's gotta be public policy steps. There's gotta be a concerted effort. In this nation we can't tolerate the new normal of a nine percent unemployment rate. That's not, that's not acceptable. And right now Congress has been stalling, really the Senate through the use of the filibusters, been stalling an up or down vote on the extension of unemployment benefits, an expansion of the home purchase tax credit, summer jobs. MORIAL: These measures, while small, could help many, many people. Lauer then turned to Today's financial editor Jean Chatzky who, finally, did offer the job seeking advice teased at the top of the half-hour, as she highlighted the best cities to look for new jobs. However Lauer then quickly returned to Morial who finished the segment with a pitch for the National Urban League and its efforts to help elect candidates in the midterms who will help advance the President's agenda. LAUER: And you know Marc, let me ask you this. I mean we're coming up to midterm elections here in a couple of months. How political does the National Urban League get with this? How much do you target candidates who have bad job policies, in your opinion, and support candidates who have good ones? MORIAL: I think we've got to highlight that there's been a lot of stalling. The use of the filibuster in the Senate troubles me the most because what it's done, it's blocked legislation that would help the economic picture, while on the same time, the very same people who use the filibuster accuse the President and others of not doing enough. So we've got to highlight the fact that there's sort of an inconsistency in that type of message. And jobs, jobs, jobs, are the most important issue we think this fall. 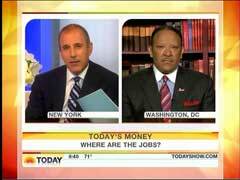 LAUER: Marc Morial, Jean Chatzky. Folks thanks very much.